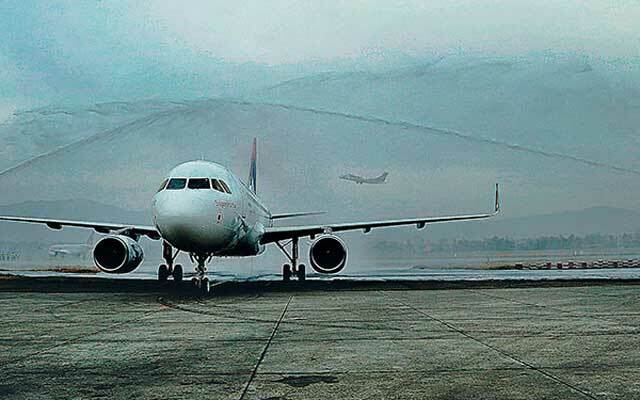 Country’s national flag carrier, Nepal Airlines Corporation, on Sunday welcomed to its international fleet a new member—Airbus A320-200 aircraft—amid a huge fanfare at the Tribhuvan International Airport (TIA). The aircraft named Sagarmatha, with the call sign 9N-AKW, made its first touchdown here at 4.34 pm to a water cannon salute. The celebratory mood was visible as the state-owned carrier acquired an aircraft for international flight after 27 years. As the single-aisle jet, emblazoned with the national flag on the right side of the cockpit, made its way to an NAC hangar, a sizeable crowd of government officials, members of the diplomatic community and airport officials, among others, welcomed it with a thunderous applause. Once the Tourism and Civil Aviation Minister Deepak Chandra Amatya-led team, which included NAC Chair Shiva Sharan Neupane, Managing Director Madan Kharel and engineers from NAC and the Civil Aviation Authority of Nepal got off the aircraft, a Hindu priest performed a pooja. Panche Baaja, the traditional Nepali musical instruments, added to the celebratory atmosphere. The new aircraft started its maiden flight from the Airbus plant in Germany’s Hamburg and arrived here after a brief stopover in the Qatari Capital Doha. The arrival of the new plane is expected to help the ailing flag carrier to measure new heights on the international routes, putting behind the problems it had been facing with two ageing Boeing 757s acquired in 1987 and 1988. At present, the NAC operates flights to only four international destinations.